In her previous books, Sarah Schlesinger took the fat out of breakfasts, appetizers, soups, main courses, and desserts, with delicious results. Now, in 500 (Practically) Fat-Free One-Pot Recipes, she has streamlined the cooking process and delivered nutritious, affordable, mouth-watering meals with minimal cleanup. Not only do these recipes all meet the FDA definition of "low fat," with three grams of fat or less per serving, but they are also freezable, reheatable, easy-to-prepare meals for the entire family. Sarah Schlesinger may have cut back on the fat and the pots, but she's kept the flavor with innovative ingredients from around the world--gingerroot, garam masala, curry, hoisin sauce, cumin, salsas, and vinegars. Among the richly flavored dishes are Salmon Chowder, Turkey Tenderloins with Vegetables in Rosemary-Wine Sauce, African Vegetable Stew, Lemon-Dilled Eggplant and Summer Squash, Potato-Tomato-Crab Curry, Curried Chicken with Apple and Mushrooms, and Black Bean Chili with Cornbread Crust. With practically zero fat, one pot, and five hundred recipes, you can prepare a healthful, delectable meal every day of the week. 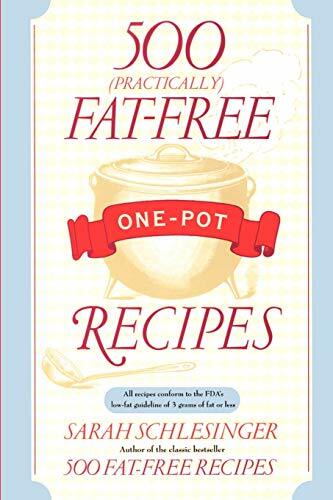 Sarah Schlesinger is the author of 500 Fat-Free Recipes, 500 More Fat-Free Recipes, 500 (Practically) Fat-Free Pasta Recipes, and five other cookbooks. She is also the chair of the Graduate Musical Theatre Writing Program at New York University's Tisch School of the Arts. She and her husband live in Greenwich Village and Lewes, Delaware.